Our community is full of fitness and workout enthusiasts that are always looking for fun and new ways to stay fit and keep active. 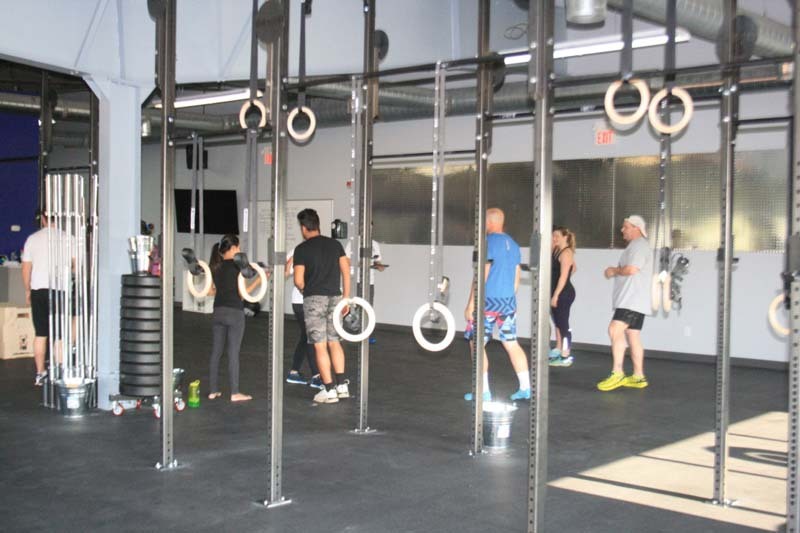 On Saturday May 14th, 2016, CrossFit Moirai held their grand opening and after having a soft launch the week before, it became obvious that this new center will be a welcomed addition to Chestermere. Located on the upper level of the Chestermere Recreation Centre, this space has been transformed to meet all fitness needs. CrossFit is an extremely effective strength and condition program that incorporates constantly varied, high intensity, functional movements. It combines elements of weightlifting, rowing, gymnastics, running and more – the workouts are never the same or get boring according to the management at CrossFit Moirai. 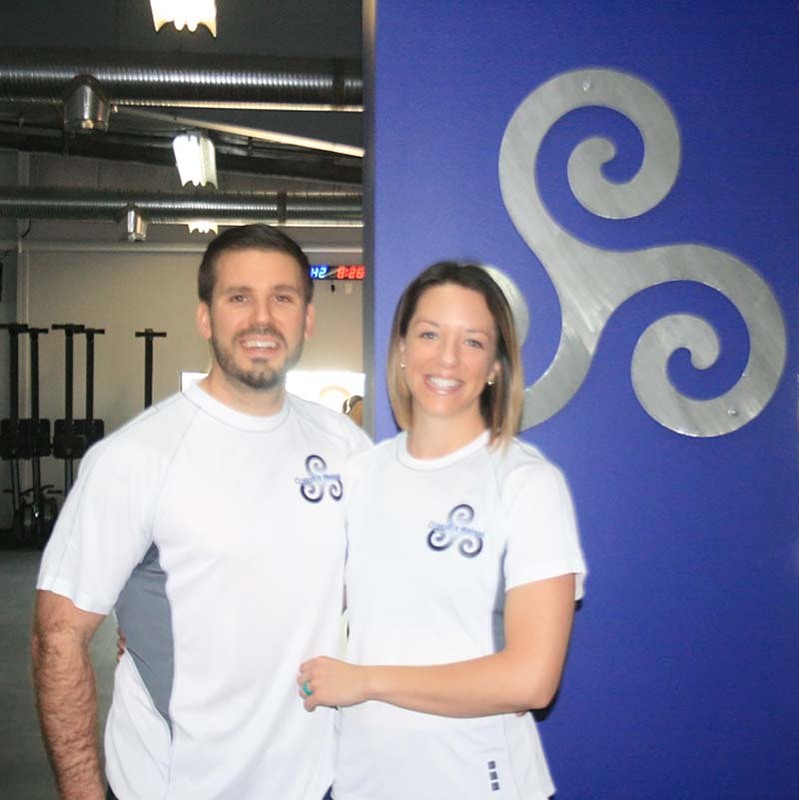 The owners of CrossFit Moirai, Carey Swift and Kyler Bateman, met when Carey moved to Winnipeg for a job in 2010. “I worked for a national call centre company and was managing the Winnipeg branch. Kyler is originally from Winnipeg. My job moved me to Calgary in 2011, and Kyler came with me”, explained Carey. The couple moved out to Chestermere in September 2014. “After finding out we were expecting a baby, we realized we needed more space than our small condo in Calgary. We immediately fell in love with the close-knit community feel of Chestermere and wanted to find a way to contribute and give back. We are both from other provinces (I am from Ontario and Kyler is from Manitoba), but we have decided that Chestermere is going to be our home and where we want to raise our family. We have one child, a son named Sevren who is 16 months old. I’m excited that he will grow up learning that fitness is a fun and important part of life”, explains Carey. Kyler and Carey both grew up as competitive athletes with Carey being a competitive swimmer for 10 years and Kyler playing competitive lacrosse and hockey. “We both love the drive and passion that comes with competitive sports, the benefits that translate into the rest of your life (eg. determination, perseverance, goal setting, etc.) and the welcoming community and camaraderie that you gain from being part of a team. We’ve found that these things are all present in CrossFit. The new business is truly a family project with Carey’s father, Doug Swift, also being part owner of the gym and their mentor, but he is not involved in the day-to-day operations. The desire to want to open their own CrossFit business began as Carey got involved with CrossFit in 2013 and when she went on maternity leave in January 2015, she found a CrossFit gym in Calgary that offered a Moms and Tots class, so she started going there with her son. “The ability to do something for me while having the flexibility to bring my young child with me was awesome. I started going to CrossFit most days in a week and fell in love with the amazing fitness program, but also the awesome sense of community CrossFit creates. I wanted to be able to share something like this with the residents of Chestermere”, explained Carey. She goes on to say, “While on mat leave, I learned that the job I’d left at the call centre company was being redesigned into something that didn’t interest me. With a lot of support and encouragement from Kyler as well as my family, I took a leap of faith and decided to resign from that job and focus 100% on starting a Crossit facility in Chestermere. Kyler, who works as an implementation consultant for an oil and gas software company, has kept his full-time job, but puts in a significant amount of work on the gym in the evenings and on weekend”. 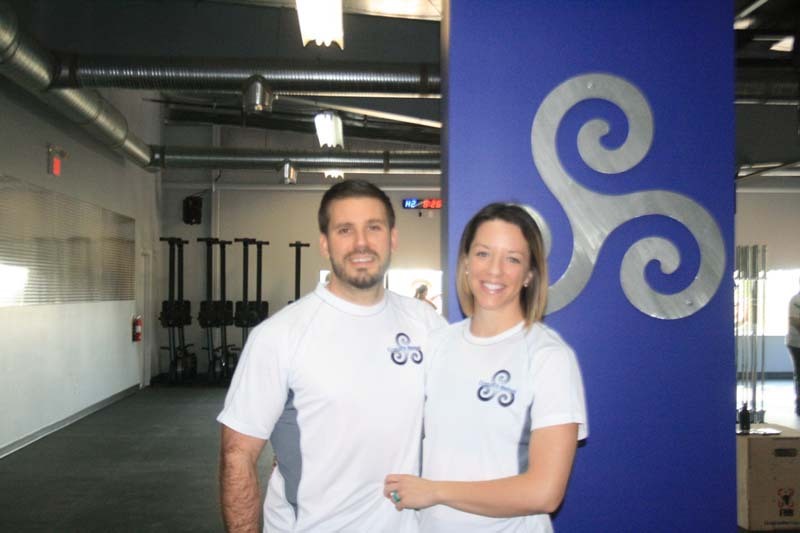 The couple noticed that there are many people in Chestermere who are involved with CrossFit, but are traveling into Calgary for their workouts. “The amazing community spirit of CrossFit works so well with the close-knit community feel of Chestermere”, adds Carey. “Our vision is not just to bring fitness to Chestermere, but to create a place where people feel welcome and supported. CrossFit is for people of all ability levels, and we want the person who is just off the couch to feel as comfortable walking through our doors as the elite athlete. We are so grateful that we were able to partner with the Rec Centre to set up our business. We feel that the Rec Centre is the heart of this community. Since our business is just as much about creating something to give back to our community, we felt that this was the right place for us to be. Our goals and visions are in line with what the Rec Centre is trying to create for the residents of Chestermere”. All of their workouts are scaled to meet participants at their current fitness level. Classes are 60 minutes long and include a warm-up, technical aspect, and Workout of the Day (which is different every day…so you never get bored and get as fit as possible). 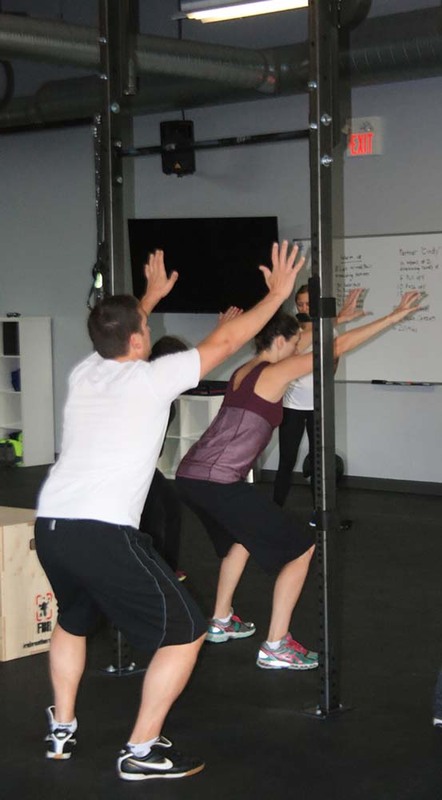 They cap their classes at 14 participants, so participants get personalized attention while at the same time working out in a fun and community-focused environment. “Our space is newly renovated, and includes a lounge/kitchenette for our members to use, as well as Kids’ Zone. Kids are always welcome at our gym. 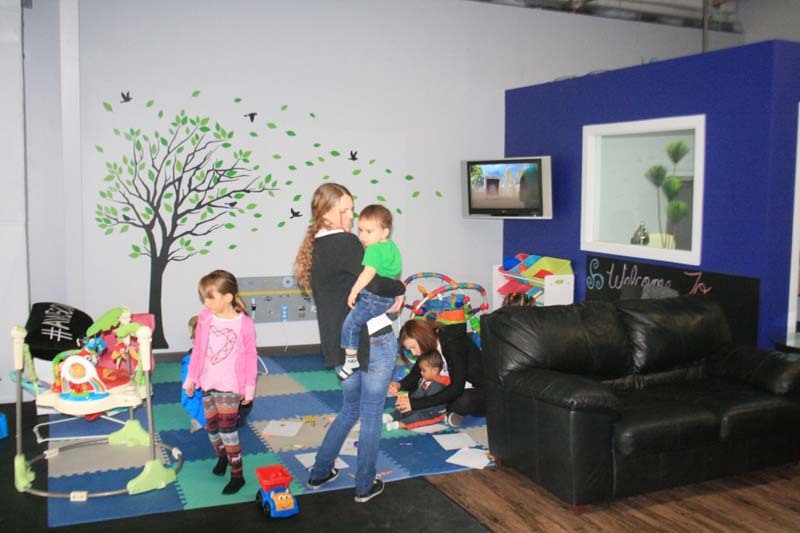 We are a family-friendly gym and we want parents to be able to workout without having to figure out who’s going to take care of the kids. In the near future, we will also be offering CrossFit Kids classes, so the whole family will be able to workout here together. While the family -focused aspect of our facility is very important, we obviously welcome members without kids”, says Carey. There are also newly-renovated showers that members can use as well, which makes it easy for those who like to work out before work. They offer early morning classes (starting as early as 6:30am right now, and they will be starting at 5:30am in June), daytime/lunchtime classes, and many classes after work and on the weekends. “Honestly, this gym isn’t really about me and Kyler. We are simply facilitating something that we believe is going to be built and defined by our members and our community. We wanted to create the spark for a place where our residents could come and workout together, get to know each other, have fun together, grow together, and give back to the community. After seeing the passion and energy brought by our members and other coaches during some of our first classes this week, we were both in awe. It’s going to be the people who walk through our doors who are really going to make CrossFit Moirai special”. With classes for all strengths – there is something for everyone!